How about a Christmas Chocolate Tango? These are the last Christmas cards that I made. I chose the very unusual colour combo of Tangarine Tango and Chocolate Chip. I just couldn’t resist playing with my new gold smooch spritzer, and I just love, love, love the results. I sprayed the cardstock. Allowed it to dry then puched out the ornament shapes and ran the cutouts through the Big Shot using the Finial Press Embossing folder. 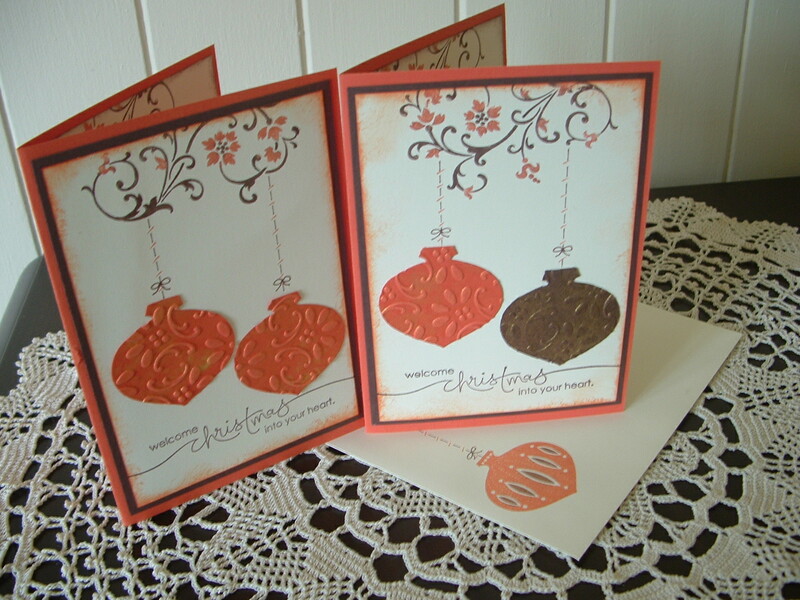 I also coldn’t resist using my very favourite stamp set, Elements of Style. It’s not a Christmas stamp set, but it looks fabulous used as a colourful and graceful tree branch. 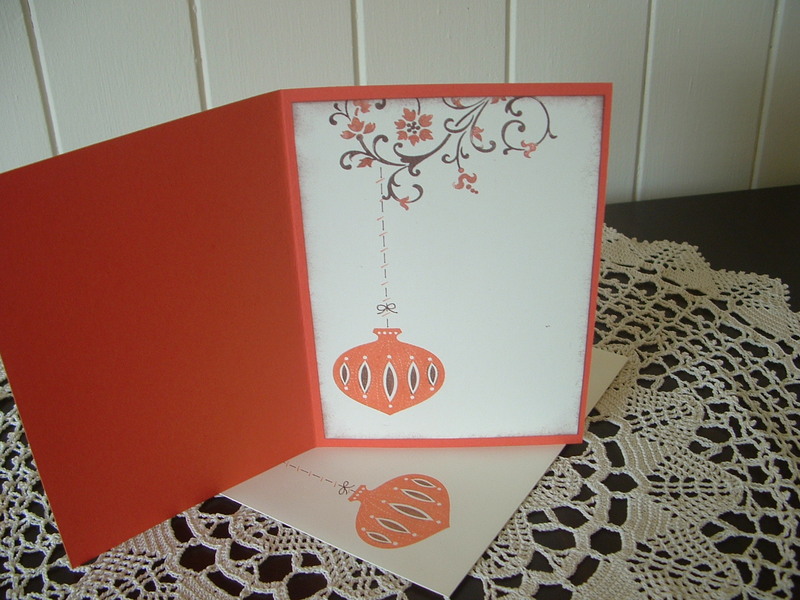 I then decorated the envelope using the Contemp Christmas stamp set. 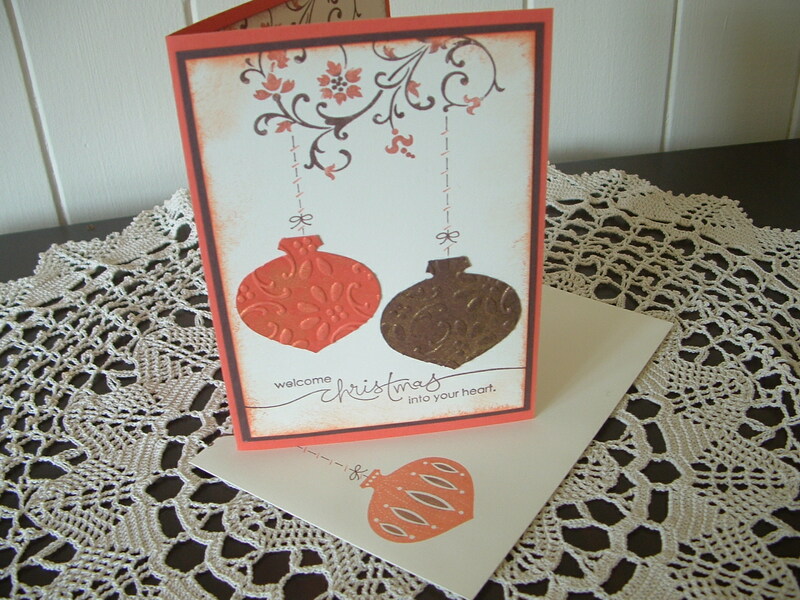 I love using Stampin’Up! envelopes. They are such beautiful quality. After making such an effort to create beautiful cards why put them in a cheap envelope???? These beauties come in both white and cream. This is the inside of the card where I’ve repeated the Elements of Style as a tree branch. I think even the amazing Teneale Williams (who is the queen of inside card decoration) would be proud of my efforts on these! Oooh! yummy Jacqui. Love the colour combo.